Gloria here today, I want to share with you a card using an Apple basket die from Cheapo dies. Here’s a closer look at the cute die cut. I cut the main piece of the apple basket using wood grain card stock and. I then cut the apples and leaves out in red and light green card stock. I mounted the apple basket onto a yellow cardstock square and then added all of that to a square scallop stitched die. 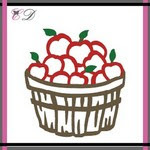 Wonderfully created card Gloria and a perfect sentiment for the apple basket die..love it!